Camp sure has changed since my mom gave me a quarter to walk to the corner school where we would stitch a wallet for a few hours. Today day camp is an extension of childcare as the majority of families need year round care. 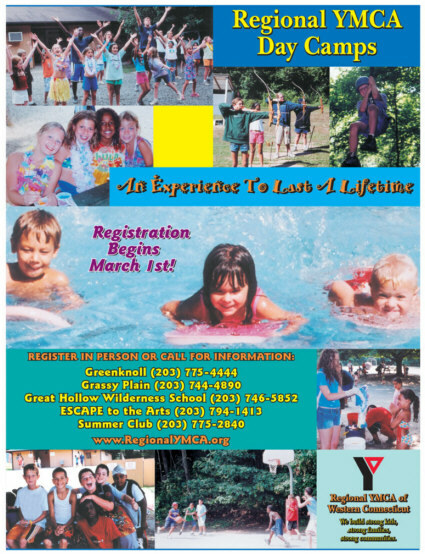 As you review this brochure please note the variety of programming that assures every child will have experiences that will give them memories that last a lifetime. Be assured that we have worked hard to create programs and recruit staff that meet the highest standards of quality, cleanliness, and safety. We offer traditional day camps, a wilderness camp, travel camps, specialty camps, and best of all hours that meet the needs of active families. All camps have as a major part of their curriculum the core values every family is committed to those of caring, honesty, respect, and responsibility. The Wilderness camp at Great Hollow is ideal for older campers who will experience a ropes course, climbing, environmental education, swimming and much more. With our 4 sparkling clean outdoor swimming pools every Y camper has a daily swim lesson as part of their experience. Hey mom or dad don't you wish you could go to camp again? YMCA's are the leaders in day camping across the country. We look forward to your child's participation and urge you to act quickly as there are enrollment limits on all camp programs this year. Your Regional Y: building strong kids, strong families, and strong communities. Explore our web site to learn more about how the Regional Y can help make lifetime memories for your child.